I tried something new this year, using clay to make ornaments. I dare say that it worked fabulously. It onl y takes a few supplies. The clay takes about a week to dry. If you want to make these for holiday gifts, then there is still time. Lay out some wax paper or parchment paper. Roll out the clay to the desired shape. Bobby and I made candy canes as well as handprints. For the hand impressions, roll the clay until it is about 1/4 of an inch thick. Press your little ones hand into it. Wipe off their hand with wipes. Then cut out around the handprint. I used a biscuit cutter, but a knife would work as well. Then use a straw to make hole(s) at the top. Smaller handprints only need one hole, but larger ones hang better with two. Let it dry for about five days. Then you can paint it as you like. For the impressions, I used a triple thick gloss and glitter. For the candy-canes, I used red paint and then after it dried the triple thick gloss. Use ribbon to hang. Viola! Cherish for years to come! This entry was posted in do it yourself crafts, handprint impressions, ornaments, Uncategorized and tagged crafts, fall art projects on December 17, 2012 by Modern Mama. The other day, Bobby and I decorated our tree. Amongst the nutcrackers, silver balls and bells, there were special ornaments to hang. These glass snowballs were made by Bobby’s handprints from past years. He was so excited to learn that he made these treasured ornaments. Now, everyday he goes to admire those ornaments. He points to them with such pride and says “i did it.” This year we’ll be making some for CJ too. These little ornaments also make treasured family heirlooms and affordable gifts. 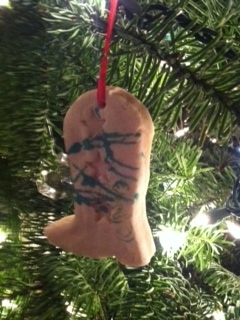 For us, we’ll be making these same ornaments every year. With a few supplies you can make them too! My color scheme is white and silver. 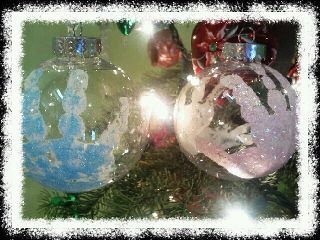 So, I bought clear glass ball ornaments and decorated them with little sparkly white handprints. 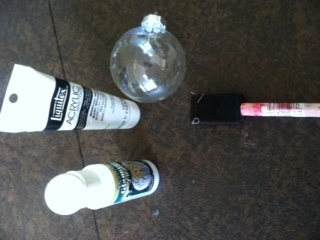 You can also do the same thing with other glass ornaments – red, silver, etc. Just think of a color scheme you want through the years. All you need are paintable glass ornaments (I get mine from JoAnn’s Fabrics & Crafts), acrylic paint, a sponge paintbrush and DecoArt Glamour Dust. Before starting make sure your little one is wearing clothes that you don’t mind being decorated with paint, get your supplies ready, and go! Squeeze acrylic paint onto a paper plate or something. Then apply paint to your child’s hand with the sponge paintbrush. Help them carefully wrap their hand around the glass ball. Repeat for as many times as you want ornaments. Go wash your child’s hands immediately – acrylic paint comes off with soap and water. After tot is all clean then sprinkle the Glamour Dust on Ornaments. Let the ornaments dry for a few days. Then use a Sharpe Pen to write initials and the year. Enjoy, treasure and share your creation. This entry was posted in crafts, ornaments, Uncategorized and tagged heirloom ornaments, rainy day activity on December 10, 2012 by Modern Mama.